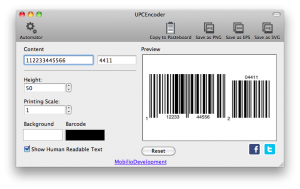 UPCEncoder is UPC barcode generator that creates 100% compliant UPC barcodes for use in package designs, illustrations, magazines, adverts, etc. The simple and user-friendly interface turns the making of UPC barcodes into a piece of cake. 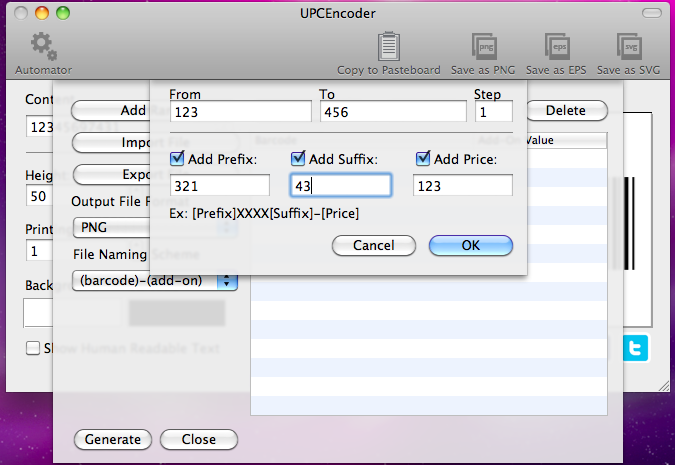 After generating the necessary code you can save it in a desired image or vector format. 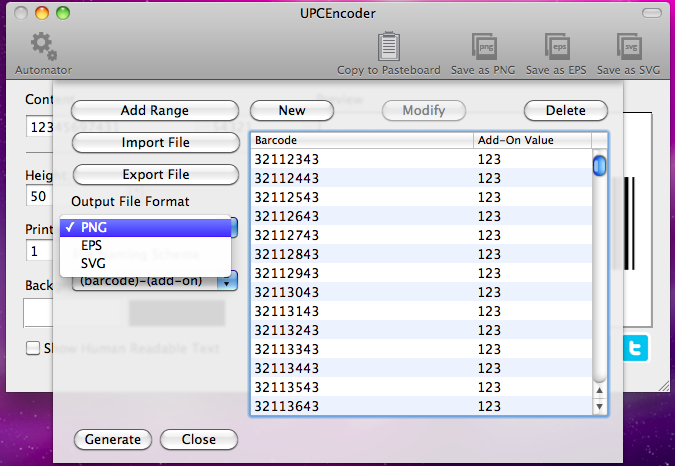 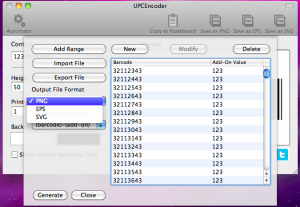 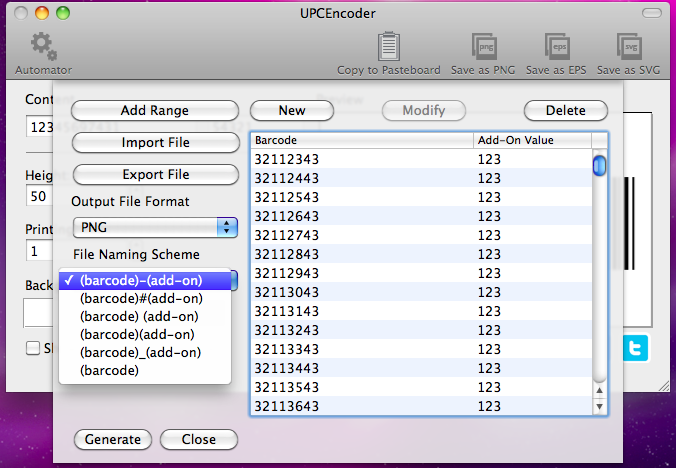 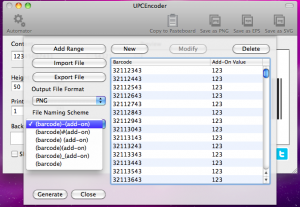 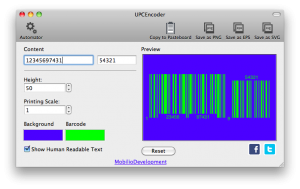 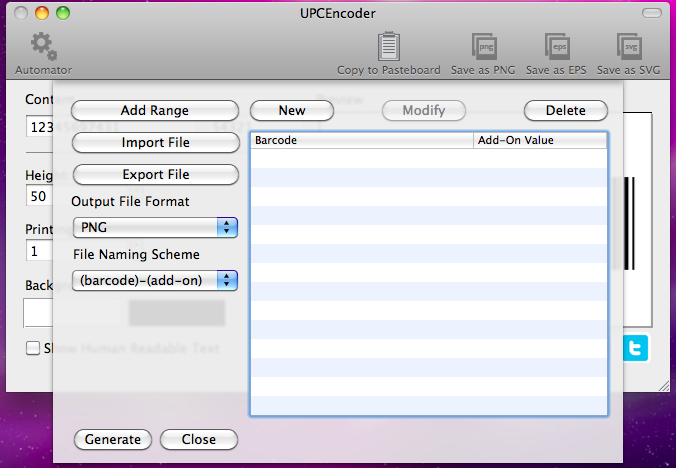 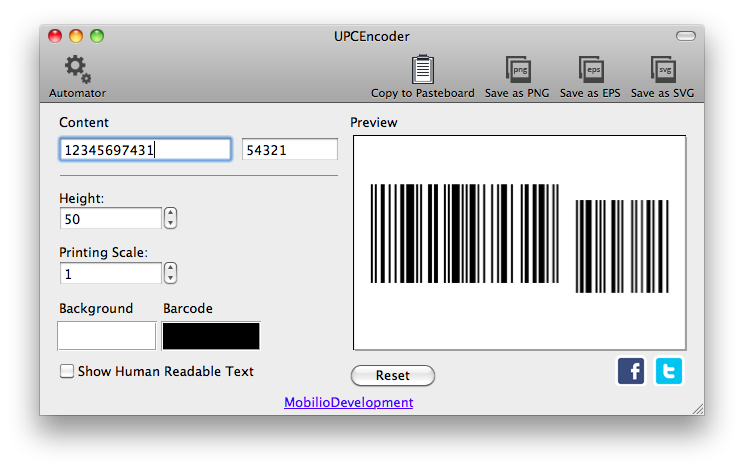 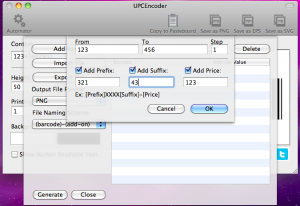 UPCEncoder will make the process of making barcodes simple as ABC. 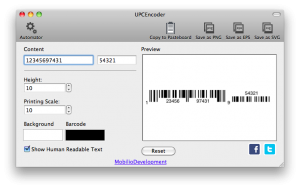 It is available on the Mac AppStore where you can find our other great barcode generation apps: QR barcode generator and EAN barcode generator. UPC barcode, where UPC stands for Universal Product Code is a specific type of barcode. Its main purpose is to provide a simple identification number for a product. 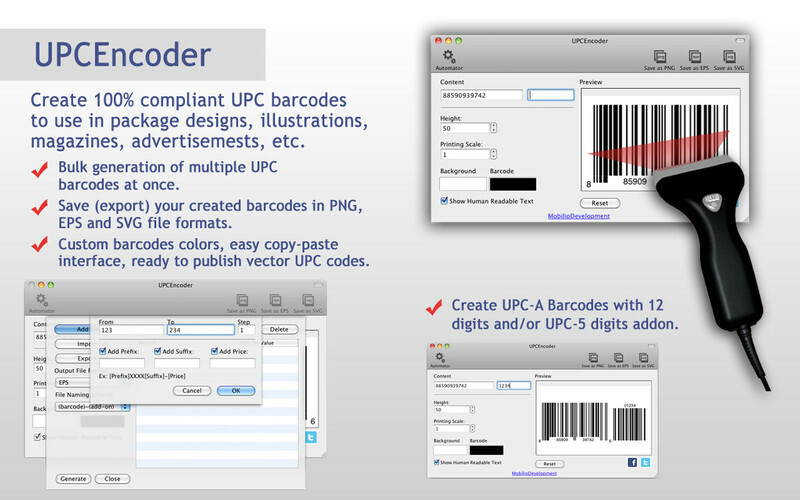 There are few versions of the UPC code but the most famous and generally preferred is the UPC-A. 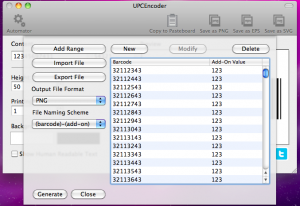 It adopts a pattern of black bars and white spaces where a total of 12 numeric digits can be encoded. 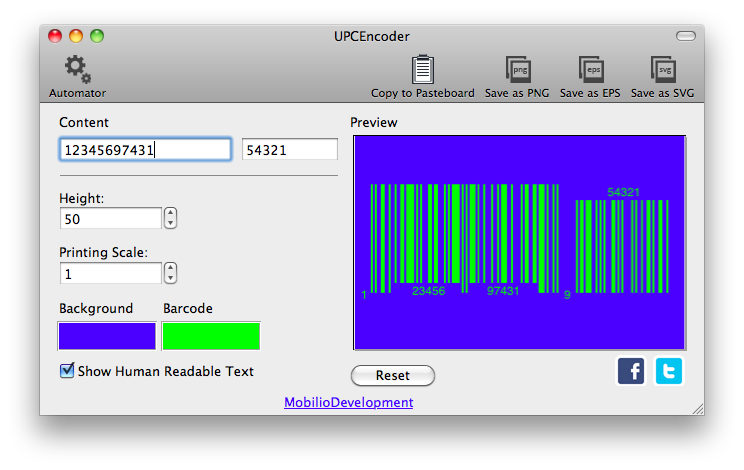 Each figure is represented by a combination of two bars and two spaces whose width varies from 1 to 4 modules. 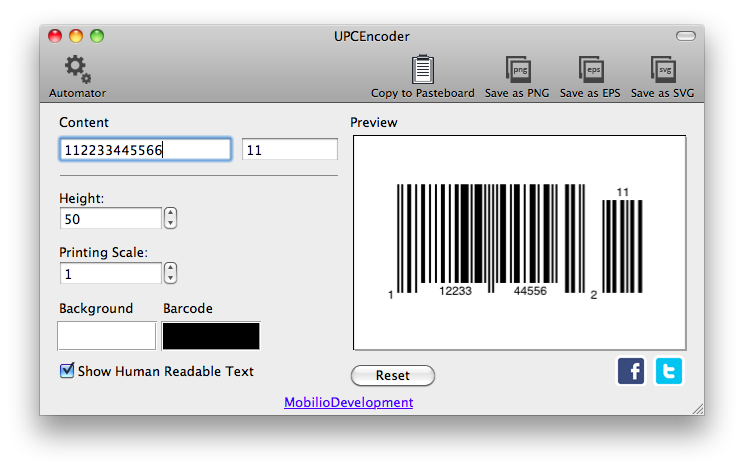 A simple of an UPC code is the following: SLLLLLLMRRRRRRE where the Ls and the Rs represent two separate groups of six digits each. The S (Start), and the E (End) blocks are based on the principle bar-space-bar (3 modules) and the M (Middle) – space-bar-space-bar-space (5 modules). The UPC Code, as well as the EAN code, is the only barcode that is allowed to be scanned while a product is being sold. 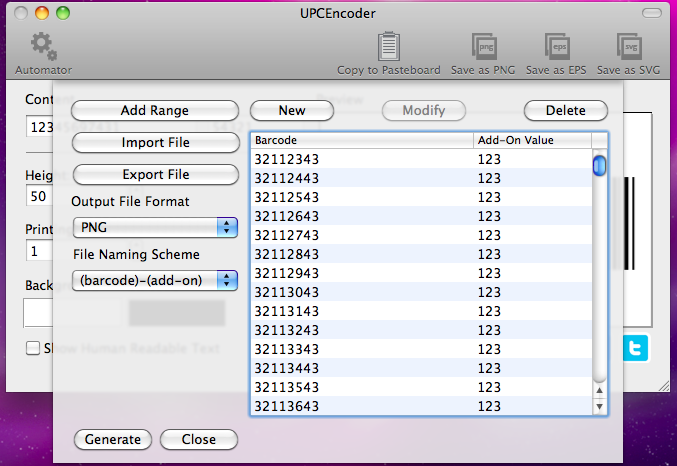 This is what makes it so widely used in the trade sector. 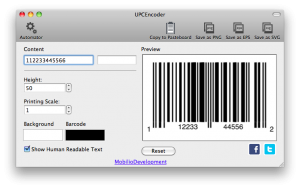 So if you are a seller, a producer or just someone who needs to create his own and unique UPC barcodes then the UPCEncoder is the perfect application for you. 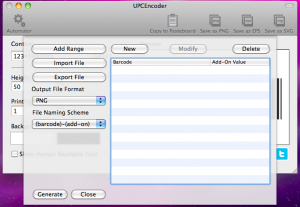 Here you can see how to work with UPCEncoder by watching our video tutorial.